The objectives of the CucCAP project are to develop genomic approaches and tools for cucurbit species, perform genomic-assisted breeding to introgress disease resistance into cucurbit cultivars, to perform economic impact analyses of cost of production and disease control, and to provide readily accessible information to facilitate disease control. Each objective includes integrated research and extension & outreach approaches. Develop genomic approaches and tools for cucurbit species. Develop genomic and bioinformatic platforms for: genotyping by sequencing (GBS); sequence data processing and analysis; and genotype, phenotype and QTL databases. Perform GBS analysis of PI collections and core populations of the four species to provide a community resource for genome wide association studies (GWAS) for current and future traits of interest. 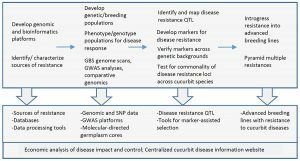 Utilize genomic approaches to map resistance loci for key cucurbit diseases. Develop and verify molecular markers for efficient trait selection and gene pyramiding. Introgress resistances into advanced breeding lines. Define, parameterize, simulate, and validate production variables based on cucurbit production crop budgets. Use a risk-based simulation model to analyze economic potential of the disease resistant cucurbit cultivars. Develop a centralized cucurbit disease website, including content in English and Spanish, providing information about diagnostics and links to disease clinics; disease control recommendations; disease alerts and links to forecasting tools. Although the primary disease pressures vary among the crops, the different crops share a suite of common diseases. In many cases, diseases that are priorities for one crop also affect the others, but less severely. Table 1. Major disease threats to cucurbit crop production as identified by cucurbit industry stakeholders.